Trade unions, opposition parties and civil society organizations are to hold a massive protest on the 21st against the electricity tariff hike and the performance of the government. The Coordinating Committee for a Joint Trade Union Alliance of Sri Lanka that has called for the nationwide strike on the 21st says it would be a protest against the increase in electricity tariffs as well as the government's current performance. The Committee will canvass for the support of the agriculture, fisheries and other sectors and also the civil society and continue to broaden its platform with the support of other organizations to further strengthen the agitation campaign against the increase tariffs. 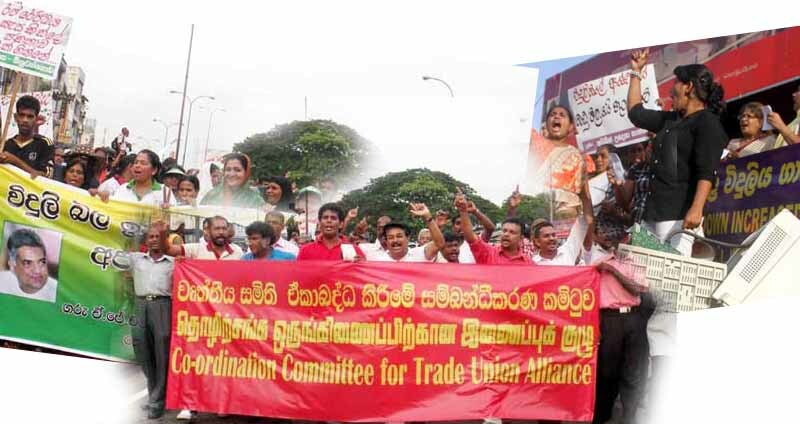 Jathika Sevaka Sangamaya (JSS), a trade union affiliated with Sri Lanka's main opposition United National Party (UNP), has also decided to fully support and participate in the nationwide strike next week.